All followers/likers would be much appreciated. I’m off to browse ‘the Interwebs’. Decompiling/Recompiling to fix a real issue – It’s been a while! I won’t be using ‘real world’ coding samples here, for obvious reasons, but I’ll lay out a scenario so you can (hopefully!) see how a spot of decompiling/recompiling could come in handy. An issue rolled its way to me that related to a legacy/archaic .Net website utilising a WCF service. First issue, important parts of the source code were not available to me. I’m sure you’ll agree, this is not a great position to be in considering we had only just reached the starting block! After a small amount of toiling, I hit the inevitable point whereby I’d solved any IIS/WCF configuration issues and now, desperately, needed to get into the meat of the source code. The only option was to extract the dlls that made up the application and supporting services and get decompiling! Armed with the dll dump and JustDecompile I went to work. Logical steps to enable basic logging at the service level had solved a handful of issues which is all fine and dandy. Unfortunately, I hit a dead end when the application surfaced an ‘unknown error’ in the UI and there was no sniff of an exception in the trace logs; bloody dark days if you ask me! 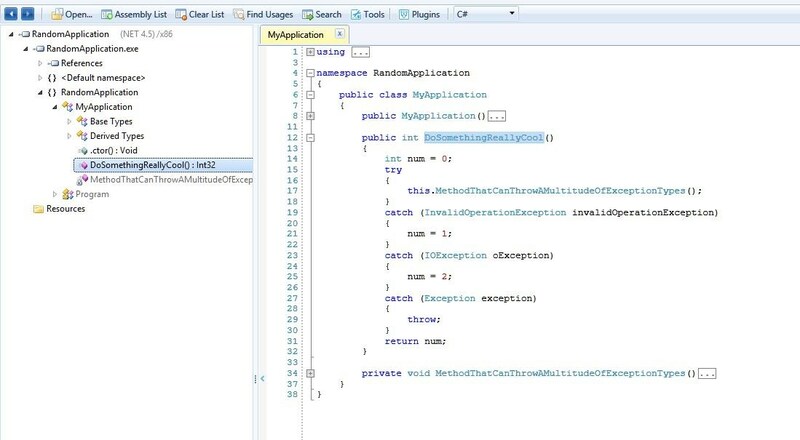 JustDecompile Showing Exception Handling Structure. Using the powers of imagination simply insert 20 or 30 lines of code (some to other helper methods all using types capable of throwing exceptions) in place of the MethodThatCanThrowAMultitudeOfExceptionTypes and you’re all set! So, the core issue here is that setting an integer variable really isn’t giving us the feedback we need in every exception case (I don’t like this approach across the board but I digress!). Based on knowledge further up the call chain I knew that I must be hitting the general ‘Exception’ handler here which made my plight even worse; I could be hitting any old exception type (insert big sigh here). The tool, in a nutshell, can be used to inspect an assembly’s manifest file in a visual way and, most importantly, access the Common Intermediate Language (CIL, MSIL or just IL) that describe the assembly. I won’t go into an in-depth discussion of what IL is but, in short, it comprises of the platform-agnostic instructions formed after compilation along with type metadata. This code is compiled, on the fly, when required by a JIT (just-in-time) compiler that is geared towards the specific platform environment. In addition, the manifest file describes the actual assembly. 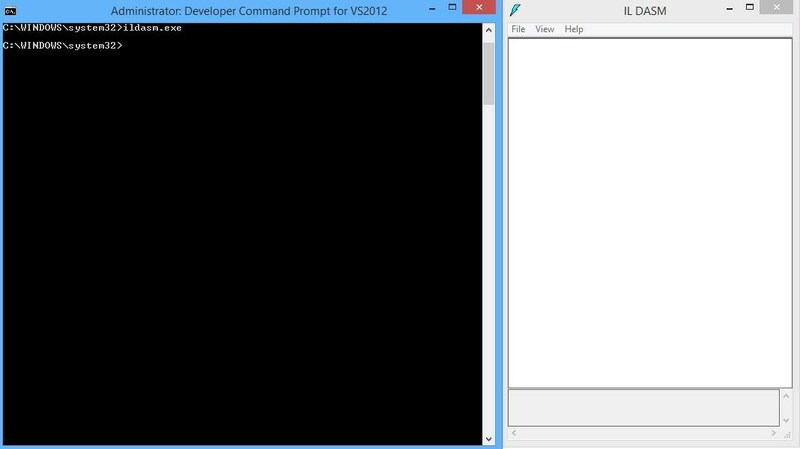 Although lower-level in nature, IL is still fairly readable and can be dumped into an IL file from ildasm.exe by using the File > Dump command as shown below. Generating and Inspecting CIL (IL). This certainly isn’t going to be a masterclass in IL coding but just as a demonstration I’m going to alter the catch handler as follows (using IL geared to throw the exception back up to the calling code). I’m sure this is an art in itself but I’m definitely not the one to teach you (maybe I’ll add it to the hit list as an interesting learning topic!). The statement begins with a ‘label’ (starting with ‘IL_’ and ending with a colon); one golden rule to remember here is not to duplicate any labels across statements. Doing so will result in errors when you try to recompile these instructions back into an exe or dll. Another word of warning at this point; I made the mistake here of recompiling my dll at the time (in the test scenario) using an incorrect version of ilasm.exe (targeting an incorrect .Net Framework). I lucked out by simply changing the IIS Application Pool to run under a newer .Net Framework version to save on recompiling the dll again. Certainly something to keep in mind however. 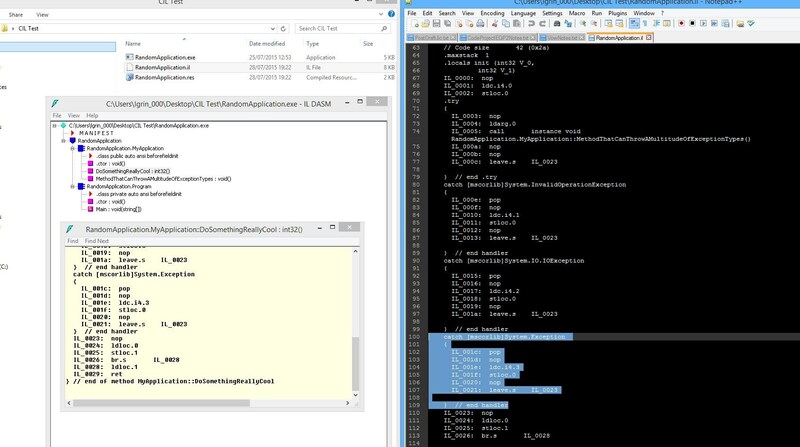 In my test scenario I was able to push this dll into the given environment, use service trace logs to identify the exception (including stack trace and additional information) and finally fix all of the remaining issues. So, if you’re stuck in future with .Net code you can’t directly alter and you have (caveat, you’ll have to work harder if the assembly is strongly-named/signed) an exe/dll that you need to make changes to in order to get meaningful outputs, consider this approach. Until the next time, thanks all! A staple of TDD (Test Driven Development), although not quite how I’ve implemented it here (as I already have too much code hanging around prior to writing any tests), the humble Unit Test is something I’ve wanted to dedicate a little bit of time to for a while; so here it is. Inclusion of Unit Tests in a project, from my own personal experience, is something that rarely takes as much precedence as it should. Sometimes they aren’t included at all; other times they are incredibly slim-line to the point of only scratching the surface – This feels like a bit of a shame. I won’t get into my own feelings too much on the matter beyond saying that I’m of the belief that they certainly have a place and add value. DungeonTests test class – Covering the EpicDungeon class. 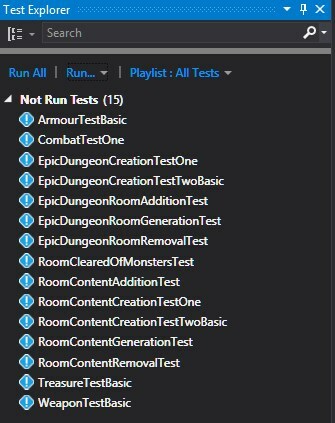 RoomTests test class – Covering the Room class (and creation of room content). CombatTests test class – Covering a very basic combat scenario which will be fleshed out further in due course. WeaponTests test class – Covering a basic Weapon object creation scenario. ArmourTests test class – Covering a basic Armour object creation scenario. 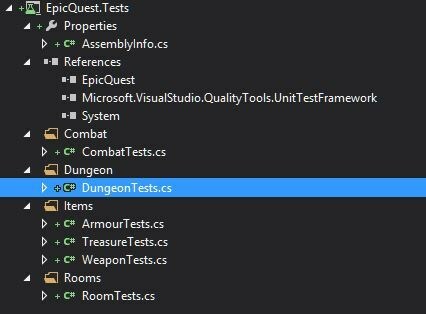 TreasureTests test class – Currently unimplemented (the concept of ‘treasure’ still needs consideration). One of key things to notice here is that the EpicQuest project has been referenced in order for us to get hold of the types we need to test. A key benefit I’ve gained since inclusion of the tests is that I’ve been forced to compartmentalise my code further to make testing distinct pieces of functionality possible. Some code has also been re-homed fully (i.e. whereby I had methods sitting within classes whereby it didn’t actually make sense for them to live there from a code structure point of view and, therefore, a Unit Testing perspective). A few difficult questions have also been posed in relation to the accessibility of certain members during creation of the test code; issues I wouldn’t have had to consider without travelling down this path. All in all, pretty positive outcomes so far. So what’s the anatomy of a basic Unit Test, how is it triggered and how can we glean valuable information from the results? 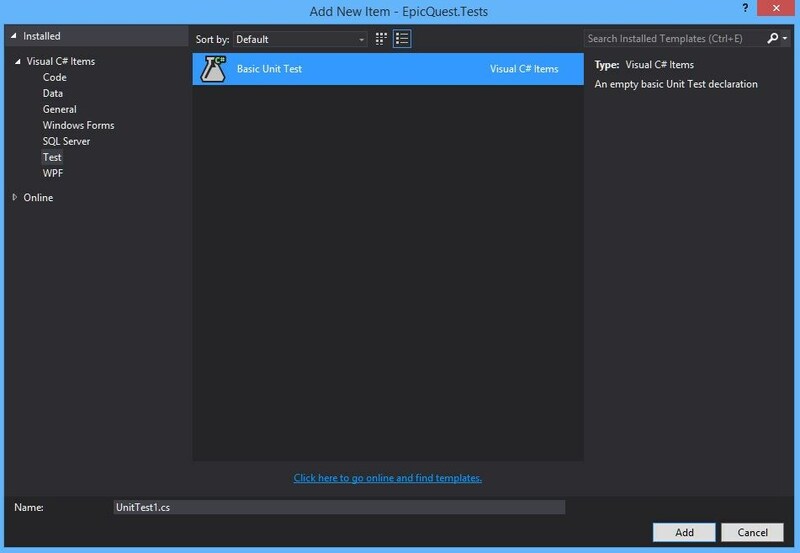 Add New Unit Test Dialog. This will provide the following stub class adorned with the TestClass attribute with a single test method, suitably adorned with the TestMethod attribute. These attributes identify the object/members as test entities for exposure in the Test Explorer window which we’ll see later. Arrange. This stage involves configuring any objects and setup as required by the test you plan to perform. Act. Post configuration you actually need to call the functionality you wish to test. Test. Lastly, assertions are run in order to see if the code under test worked as expected. Walkthrough: Creating and Running Unit Tests for Managed Code. In order to see if the code under test is working as expected the static members of the Assert class come into play (of which there are a few, see the Assert Class MSDN documentation for a full listing). In the above listing, I’ve opted to firstly use Assert.IsFalse to make a logical test to see if the Room instance I am expecting to be removed by the RemoveDungeonRoom method has actually be taken out of the EpicDungeon instance. Lastly, I’ve called on a generic version (which is awesome!) of Assert.AreEqual to make a secondary check to ensure the remaining count of Room objects in the EpicDungeon is as I would expect, following the previous Room object removal. The Assert static members allow for value types and objects to be passed in for inspection and, in the instances I’ve seen, for a string message to be specified; to be shown if the test fails. You’ll see other examples of Assert methods in action, such as the Assert.IsInstanceOfType, in later examples. The Assert class and the members on offer are fairly intuitive right off the bat; you’ll probably only need a few minor peeks at the documentation to get underway if you’re familiar with C#. NOTE: Some of the xml comments and variable names, etc have been tweaked throughout the code at varying times meaning some of the screen shots you see may fall out of line slightly with the code samples. If something is functionally different then I have gone back and altered the screen shots to align with the code. /// for the Epic Quest game. /// is working as expected. /// as expected (very basic test). /// object constructor is working as expected. Accessing the Test Explorer Window. The Test Explorer Window (Initial State). /// of content to be added to this particular Room. Now we are using the foreach item variable correctly and adding this to the roomFeatures collection. 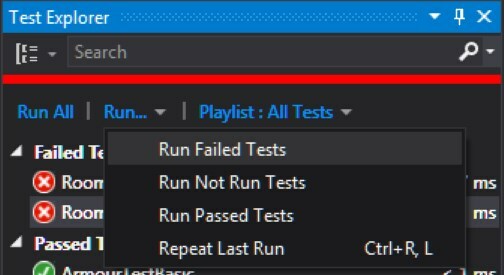 Failed Tests in the Test Explorer Window. The failed tests run up and we can see that these tests run without error, happy days! 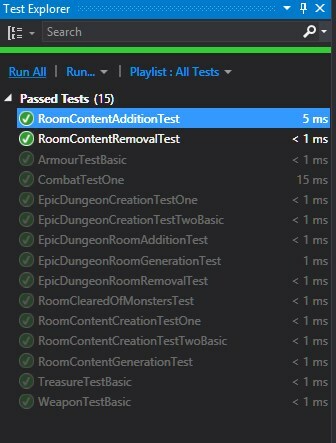 Passed Tests in the Test Explorer Window. As for Unit Testing, that’s about it for now. The only other small alteration I’ve made to the existing code base at this time is removal of the HandleCombat method from the GameManager class (to aid in Unit Testing/general code structure). This now resides in a new static class called StaticGameActions. /// can be handled between two ICombatant based objects. That’s about it folks for the time being. 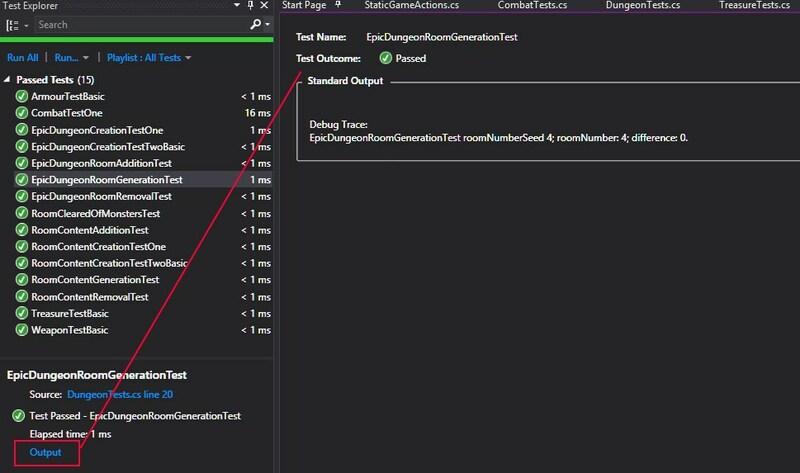 Unit Testing is an interesting topic that requires some further investigation so I want to bring you another small piece looking at the TestInitialize and TestCleanup attributes and how more in depth tests can be constructed. In other news, I’ve upgraded my blog account and got a new domain which I’m sure you’ll notice (splashed some cash as promised!). I’ll shortly be, as stated, making a few styling tweaks to the theme in addition to adding a dedicated Facebook page and Twitter feed, so watch this space. I’m back from my hiatus which encompassed getting married, eating far too much food and drinking wine and beer on the wonderful Adriatic coast. It’s time to get back to some serious coding and perhaps reconsider the longer term plans for this blog. To start us off, I’ve been contemplating pushing a little money into this to sharpen up the experience a little and will most likely give the blog some dedicated presence on Facebook/Twitter. Why do it by halves; I’ll go balls deep and hope for the best! There are numerous items that I previously wanted to, and still plan on, covering but other nuggets of technology have caught my eye in the interim. In addition to just writing code, I would also like to reflect on my own methodologies for learning subject matter and trying to improve comprehension as I progress on this journey. Anything I do to this end will get ‘air time’ within this blog and I’ll you all know if I come across anything that works particularly well (or falls flat on its face!) as and when it happens. Lastly, although not strictly ‘code’ based, my wife (weird to say that!) plans on starting her own business this year so it provides us both with an opportunity to reimagine our workspace in the home. The plan is to turn our crap-hole of a box room into a useable work area; as we get stuck into this I’ll post updates to show how this evolves. As we all know, putting something down on paper (or the internet!) is the first step on any journey. Here’s the redefined hubs of activity as I see them covering things you can expect to see on this blog in 2015/2016. Reimagining of the Blog and some kind of dedicated presence on Facebook/Twitter. Changes to our home workspace to show you how this progresses. Speed Reading Techniques – Udemy Course featuring Jonathan Levi. The First 20 Hours – How to Learn Anything Fast by Josh Kaufman. Finishing off the Epic Quest project. Hello World level Raspberry Pi. Coding against the Leap Motion Controller API. Further C# Unity game development (I still see myself covering a larger scale project encompassing the use of Blender, Gimp and Unity to make a standalone title). Posts covering C# and TSQL (I’ve done some MySQL work recently so I will incorporate this into the proceedings if possible) as interesting topics catch my eye. 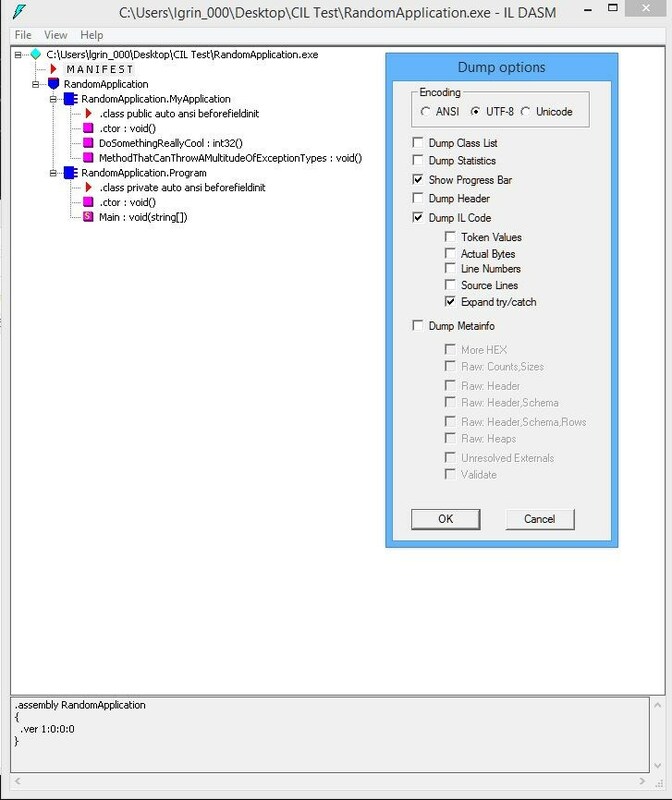 WPF (Rooting around in XAML) as time allows. In and around this, I’m starting to sniff around the idea of completing full Microsoft Certifications in the next year to year and a half, so as I hop hurdles surrounding this I’ll give you all of the details. This is not really designed to be a personal ransom note and I’m not going to outright hold myself to completing all of these things, but I do want to make a commitment to producing content as and when I can and keeping this fun (for myself and anyone reading along). All that’s left to say is wish me luck and watch this space!